Are you participating in the Darkmoon Faire? 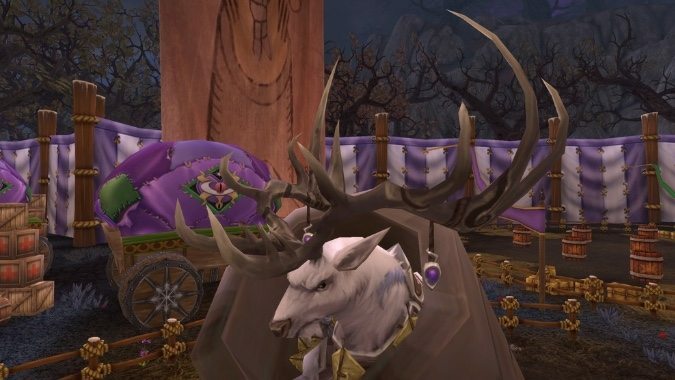 I love Darkmoon Faire week for precisely one reason: that sweet Darkmoon carousel buff. Over the course of the month, I save up all my reputation insignia tokens until the faire comes around, then I use them all at once on the carousel. I also pick up the buff before I do world quests and emissaries. It’s really handy for the Paragon reputation mounts that keep eluding me. I started leveling a Nightborne character this week, so the carousel has been performing double duty for reputation and experience gains. As for the rest of the Darkmoon Faire, usually I’ll stop off to do the profession quests for easy Darkmoon Prize Tickets and turn in any quest items I picked up from my Darkmoon Adventurer’s Guide. I used to do all the daily minigames on multiple characters when I was really gunning for collecting all the transmog. However, I burned out real quick after trying to do seven a day for an entire week. It’s also not worth it as much since Blizzard hotfixed the prize boxes to be soulbound. There’s still a lot of new stuff at the faire that I just haven’t gotten around to this expansion that I keep meaning to do. Like the Death Metal Knight and the Blight Boar Concert. There are a bunch of cage helms for each armor type, a concert toy, and even a guitar mace. Heck, I’m even still saving up for the nobles’ finery from Chester, and he was introduced during Warlords of Draenor! However, to be fair, I did just recently finish collecting the 1000 prize tickets for the Darkmoon Dirigible. I still have a lot of the dungeon transmog pieces to collect, so I expect I’ll keep going to the faire for a long while. How’s your Darkmoon Faire experience? Do you go gung-ho in all the minigames and activities or is it barely a blip on your radar? What do you do each month when the Darkmoon Faire is running?